We bring you a simple lined, spacious and soft- shaped crossbody bag for casual long lasting wear for everyday use. Add some flare by attaching a decorative studded accessory in hairy calf skin animal print and turquoise short fringes. Wear casual as a crossbody or short by the waist. Fully lined with with Carolina's design pattern fabric.This is 100 % finished top quality, handmade selected bovine leather. - Metal hardware in best available quality, and YKK zippers. - Top zip closure, one inner pocket, one outer zipper pocket. - Key holder string and cell pocket inside. - Adjustable strap for shoulder or crossbody wear, strap drop 32 ". 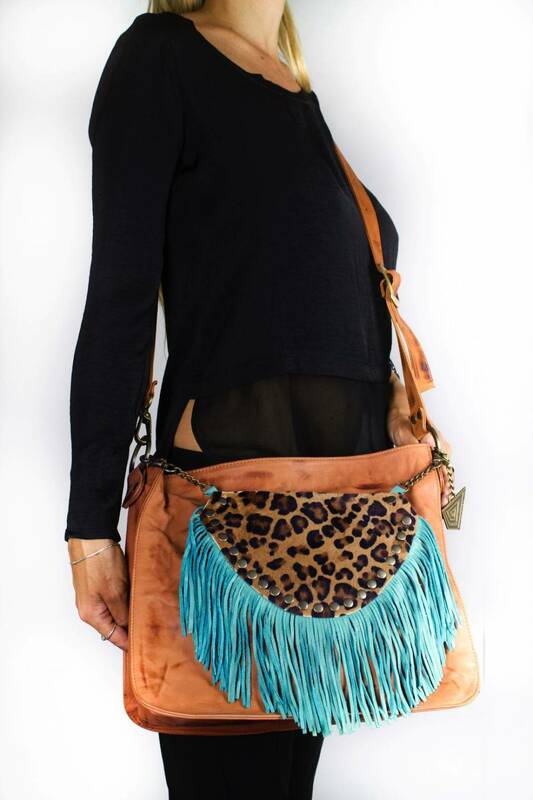 orative accessory in calfskin with hair animal print design with turquoise fringes.